In later years, when John O’Connor was diagnosed with Alzheimer’s and Justice O’Connor retired, Marty was the only male member of the group. He didn’t care, said Cathleen Douglas Stone, widow of William O. Douglas. “Marty liked being a spouse,” she wrote in Chef Supreme, a cookbook of Marty’s greatest hits put out by the Supreme Court Historical Society. “I remember being surprised when I realized his dishes weren’t catered,” she added. On each clerk’s birthday, Marty would bake a cake—almond or chocolate, sometimes ginger, lemon, or carrot. The justice would leave a to-the-point note: “It’s your birthday, so Marty baked a cake.” Sometimes the clerks would mull the day’s work over Marty’s biscotti. Aug. 10, 1993: RBG takes the court oath from Chief Justice William Rehnquist during a ceremony at the White House. Martin Ginsburg holds the Bible. You are the only person I have loved in my life, setting aside, a bit, parents and kids and their kids, and I have admired and loved you almost since the day we first met at Cornell some 56 years ago. What a treat it has been to watch you progress to the very top of the legal world!! I will be in JH Medical Center until Friday, June 25, I believe, and between then and now I shall think hard on my remaining health and life, and whether on balance the time has come for me to tough it out or to take leave of life because the loss of quality now simply overwhelms. I hope you will support where I come out, but I understand you may not. I will not love you a jot less. Marty died on June 27, within a week of their wedding anniversary and of the day RBG’s mother had died. It was also the most important time of the Supreme Court calendar, the end of the term when all of the big decisions come down. The court was sitting the day after Marty’s death, and RBG had an opinion in a key case, which said that a Christian group at a public university could not bar gay students from attending meetings. Jane and James told her she had to show up in court; after all, she had never missed a day. “My father would certainly not have wanted her to miss the last days on the bench on account of his death,” says Jane. And so she sat there, very still, with a dark ribbon in her hair. As Chief Justice Roberts read a brief tribute to Marty, Scalia wept. Marty was buried at Arlington National Cemetery. Not long afterward, the folded American flag from his burial sat on the windowsill of RBG’s chambers. 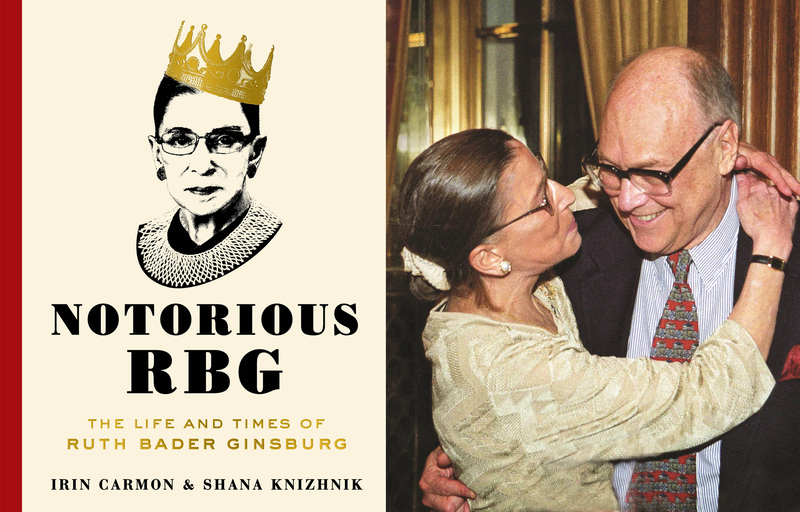 Reprinted with permission from Notorious RBG: The Life and Times of Ruth Bader Ginsberg, available today. Copyright © 2015 by Irin Carmon and Shana Knizhnik. Photos via the Collection of the Supreme Court of the United States, the AP.